Find hotel near The Springbok Experience ..
Offering more than 602 interactive displays explain the history of South African rugby; it also has trophies, jerseys, boots and other memorabilia about South African Rugby. Online ticket booking is available. Students, pensioners and families have reduced tickets. 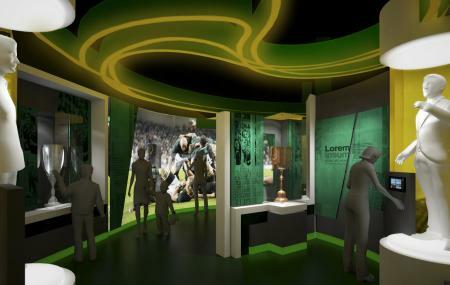 How popular is The Springbok Experience Rugby Museum? People normally club together Tiger Tiger and Constantia while planning their visit to The Springbok Experience Rugby Museum. I didn't join a tour or go through the experience, I just looked in at the gift shop. The staff were not all that friendly, the shop was well stocked if branded rugby jerseys are your thing. I think the tour could be very informative and interesting. This place gives you great understanding of the history of rugby in South Africa, it has fun and interactive activities for kids and is a must visit if you are interested in Rugby. It goes all the way back to the 1800s with memorabilia, paintings and more. You'll also get a free draught beer at Quay 4 for visiting this place. Quite a good experience but it did need a bit more f cleaning up. Very nice. The museum has an interactive exibition and a lot to tell about Rugby history.